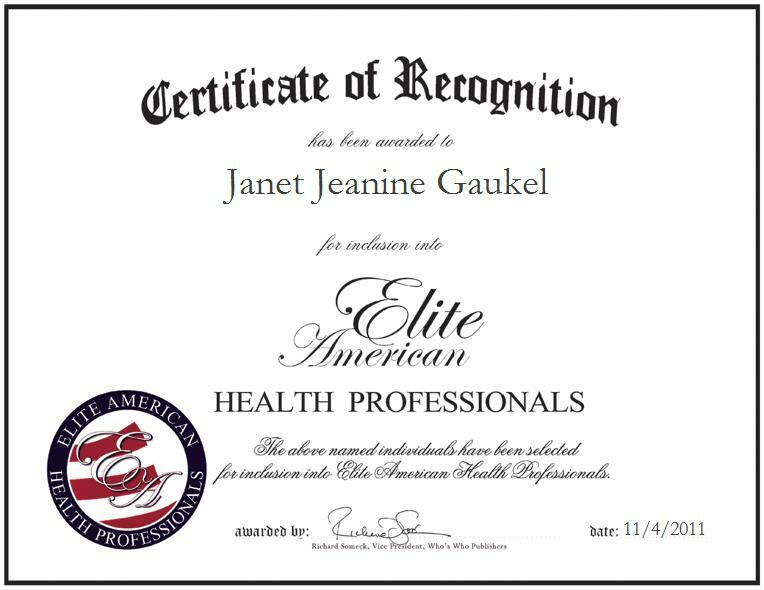 Bloomington, Minnesota | November 4, 2011 | Janet J. Gaukel, Retired Staff Pharmacist, has been recognized by Elite American Health Professionals for demonstrating dedication, leadership and excellence in consulting. Mrs. Gaukel has amassed nearly two decades of professional experience, and in her former capacity, she was able to build a skill set that allows her to currently shine as a medication consultant and monitor. Prior to her retirement, Mrs. Gaukel was responsible for dispensing medication, and she is now able to consult with medical professionals and give them the guidance that they need in terms of health services administration and the many ways to ensure that pharmaceutical services are being properly applied. She feels that she has been able to achieve success as a consultant due to her concentration on applying her networking skills to her work. She is also grateful to her family, as she has been fortunate to receive their support and encouragement for years. Mrs. Gaukel was inspired to pursue her current career path by the knowledge she gained after acquiring a Bachelor of Pharmacy from the College of Pharmacy at the University of Minnesota. She is grateful to have gone back to school to obtain a degree and follow her dreams, as she feels fulfilled, and driven toward accomplishing additional missions as a consultant in the health care field. The admitted late bloomer feels that she is separated from others in her field by her ambitious nature, as she stood up for her dreams and goals. She has garnered a reputation of excellence for going above and beyond in her purpose to mentor those with whom she has worked. Mrs. Gaukel raised six children before obtaining a bachelor’s degree and becoming a licensed pharmacist in four states. She also mentored first-year and older students in the University of Minnesota’s pharmacy program. Ever determined, Mrs. Gaukel works hard to help others and give them the same advantages that are afforded to those in her position. If she could solve one problem, she would alleviate hunger in underprivileged countries. She hopes to be remembered by her peers as somebody who was helpful and who really cared about them.